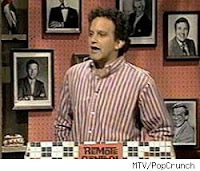 When I heard that "Remote Control" host Ken Ober had died, the first thing that hit me was the theme song, which hadn't flicked across my brain in years: "Kenny wasn't like the other kids...TV mattered, nothing else did..." Then I wondered why I hadn't thought about the show in so long. It took the traditional game show format and cut away everything but the pop culture references. No questions about pesky topics like history or geography. Just TV. And that was just fine with me. Ober and his crew -- including everybody from Colin Quinn to Denis Leary to Adam Sandler to Kari Wuhrer -- put on a sometimes hilarious, always entertaining show down there in his mom's basement. Former "Remote Control" writer Jeff Kahn has a nice little tribute on the Huffington Post.